B. Bear (formerly known as Baby Bear) and Lolly (short for Goldilocks) are best friends. After all, they like all the same things. 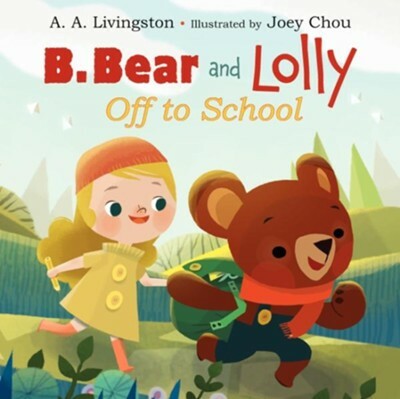 With a bear-and-girl friendship that fits just right, this duo is ready for any adventure—even going to school for the first time. New York Times bestselling author A. A. Livingston celebrates the power of friendship to overcome first-time jitters, and illustrator Joey Chou's bright, bold art playfully complements this fun twist on a fairytale classic. Kids who may be a little nervous about their own first day of school will be inspired by B. Bear and Lolly's story. A. A. Livingston is the New York Times bestselling author of more than two hundred books for children (under the pen name Annie Auerbach). She is also the author of B. Bear and Lolly: Off to School. She has never spotted any runaway cookies, but she did once see a herd of cupcakes break out of a pasture and stampede down the road where she lives, outside Portland, Oregon. Joey Chou was born in Taiwan and moved to California in his early teens. There he received his BFA from Art Center College of Design in Pasadena. Joey has worked as an illustrator for feature animated films and has illustrated several picture books, including B. Bear and Lolly: Off to School. When it comes to cookies, chocolate chip has always been just right for Joey. I'm the author/artist and I want to review B. Bear and Lolly.